"Email Client for Notmuch" extension brings a Gmail like email client to your offline email accounts using the powerful Notmuch email indexing command-line tool. In the simplest form, this extension is just a graphical user interface for the Notmuch tool but it can be enhanced by using shell scripts to perform different actions. For instance, you can define a periodic job for the extension and ask it to display the output of the batch script in the toolbar area. This can be used to run a command-line email fetcher (like the powerful offlineimap command-line email fetcher), then run Notmuch to index the newly fetched emails and finally ask Notmuch to print the total number of unread emails into the stdout which will be shown in the badge area. "notmuch" is a command-line email indexing tool. You need to have it configured before trying to use this extension. See https://notmuchmail.org for more info! Maildir is a file structure format that is commonly used to store email files locally. This extension assumes your emails are located inside a root directory and are stored in the Maildir format. Read https://en.wikipedia.org/wiki/Maildir for more info. What is the "Email Client for Notmuch" extension and how does it work? 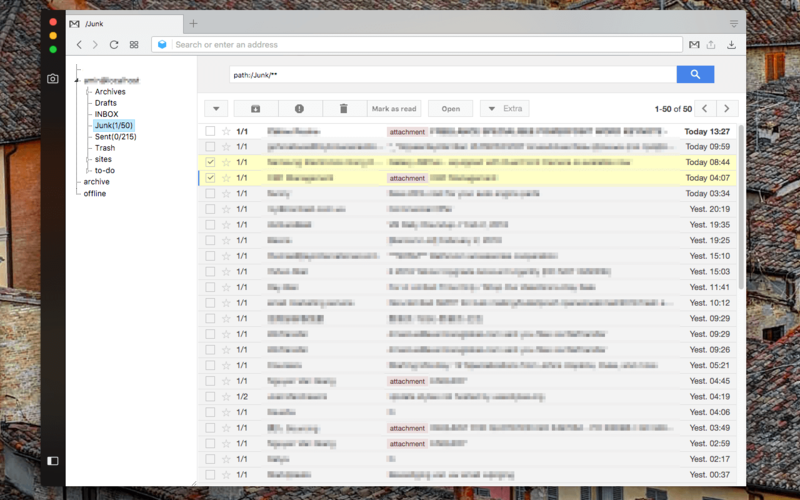 This extension brings the power of notmuch email client to your browser. Basically, it is a GUI for this command-line email indexing tool. When the extension is installed a toolbar button is added to your browser. Clicking on this button opens the actual email client UI. On the first install, you will be asked to install a native client which allows the extension to communicate with the notmuch email client. Note that this extension assumes you have a working configuration for your notmuch email client. When the native client is installed, click the toolbar button once again to open the client. When the client is opened, it will ask notmuch to provide the root directory for user emails. This is stored in your notmuch configuration file ([database] > path) and can be seen by running "notmuch config get database.path" command. The extension GUI has three sections: "Search", "Tree", and "List" views. When the root directory is resolved, the "Tree" view will list all directories in this root directory and displays them in a tree-like style on the left side of the client GUI (note that a "." in folder name is considered as a child node). select a folder from this list causes the "List" view to load emails that match with "path:folder-path/**" query. Basically this will result in displaying all the emails that are located in the selected folder in the "List" view. You can switch to a different folder by selecting it from the "Tree" view. In the "Search" view you can search for any notmuch compatible queries (results will be shown in the "List" view). I am a Windows user. Can I use this email client? If you have Windows 10, yes! You can use the built-in Linux subsystem. For more information check WSL installation guide; it is recommended to use Ubuntu distribution. Note that as of version 0.2.8, in the Windows OS, all the commands are prefixed with C:\Windows\System32\wsl.exe. So if you want to run a shell script to archive emails on the options page (e.g. : use /path/to/archive.sh [threads] [query]) where the path is meant to work on the Linux subsystem. But the actual command that will be executed is C:\Windows\System32\wsl.exe /path/to/archive.sh [threads] [query]. So basically you need to install a preferred Linux subsystem in your Windows 10, then install the "notmuch" program and configure it. You can use this email client to view your emails! Can I ask the extension to display the number of unread emails in the toolbar badge area? Yes, basically this extension is capable of running a single OS-level command (or multiple commands located in a shell script) once per pre-defined interval and display the result in the badge area. This can be used to display the number of unread emails and update the counter once per while. To do so, open the options page and fill the "command" variable with the path to an executable (a sample is provided below). This script will be called once per 5 minutes by default with a single argument which is either "true" or "false". "true" means the extension expects the script to optionally run a server synchronization job and then return the count. "false" means there is no need for a server synchronization job. Here is a sample script that uses “offlineimap” command-line tool to fetch new emails and uses notmuch to find the number of unread emails. $1 will be the sync argument. If the extension asks for synchronization, then offlineimap is executed with “-u quiet” to prevent any std prints. To make sure there will be no std prints use “&> /dev/null;” as well. When syncing is over, a silent “notmuch new” is called to make sure database is updated. Now “notmuch count” is called to calculate the total number of unread emails in the INBOX folder. Note that in this example RegExp is used to find the matching folder. You can simply use the relative path for a faster operation. Note: The extension always requests syncing unless this is a sync request from the right-click context menu or a message is tagged from the “List” UI. Note: You can change the interval of this periodic job by altering the “interval” variable in the options page. The minimum acceptable value is 1 minutes. Note: When a request for executing the external script is placed, there will be a delay before actually running the script. The default value is (delay = 2 seconds). You can change this value from the options page. Can I use this extension to "archive" messages like what I do in the Gmail UI? In this script, “notmuch” is used to search a query which is passed by the extension to this shell script and for matching files (note the –-output=files argument) “mv” command is used to actually move the file to a new destination. Now set the “archive” variable in the options page to “archive.action = /path-to-archive.sh/archive.sh [threads] [query]”. I am pressing the "Trash" button but the actual email file is still in the folder. Am I doing something wrong? When the "Trash" button is pressed, the extension finds the matching emails and adds "deleted" tag to them. Notmuch will ignore those emails in the search result but the emails are still in the folders! To actually delete the emails you need to use "notmuch search" to find all the emails with the "deleted" tag and then actually delete them or move them to a trash-like folder. You can do this in by defining a new custom-command as described below. Is it possible to run a custom command based on the search query? Now refresh the client. In the extra menu, you will get a new list item called “Move deleted emails to Trash”. When this item is clicked, the “trash.sh” script is called. Like the “archive” command you can also pass “[thread]” and “[query]” arguments to the executable. Note: the “classList” key is an array object. If this array has “selection” keyword in it, then the added item is only enabled when there is a selection in the “List” view. Use it when the action is related to the selected threads. Note: if “warn” key is defined, then you will get a confirmation box before actually executing the external script. /usr/local/bin/notmuch search --output=files tag:deleted | xargs -I % sh -c "mv % /path-to-a-trash-maildir-direcotry/cur/"
Note that if the output of the command returns threads as “thread:…” formart, those threads will be selected in the list UI after the command is executed. You can use this method to find for instance spam emails. Just run the external command that detects threads that are likely spammed and then ask the external command to return threads. When the command is executed, those threads that match the output of the external command will be selected. In Gmail, some tags are colorful. Can I do the same with this email client? Is it possible to have colorful email threads like what we can do in Thunderbird? The first rule is to change the color and background color of the entry. The second rule changes the style of all tag elements for this entry. I have accidentally clicked an action and now I need to undo it. Any option for that? There is no real undo button in this extension. It is pretty hard to undo a user-action for instance. Though you can ask the list view to return the last 30 actions and the query that is used for these actions. Let' say you have accidentally deleted an important email. Use the Extra -> Copy last 30 actions button. Paste the result in a notepad and find the thread id. Now search for that thread id and move it back. Note that you might need to select at least one email for the "Copy last 30 actions" to be enabled (this is a bug and will be fixed soon). Why I don't see the entire thread when I open an email? An entire thread might be huge and may take sometime to be fetched. Normally you need those emails that are matched with the current search result. Anyhow if you need the entire thread, use Shift key while clicking on the "Open" button. How can I reply to an email? As of version 0.2.7, there is a reply button. Click the button to prepare a reply (to reply to all senders use Shift + Click). You can edit all parts and then hit the "Reply" button to send your message. To send a message you need a command-line program that can send emails. For instance lets configure Swaks - Swiss Army Knife for SMTP to send the replies. "action": "path-to/reply.sh \"[from]\" \"[to]\" \"[body]\"  \"[subject]\" \"[in-reply-to]\" \"[references]\""
Note: The Bash script first checks the sender ($1) and then prepares the SMTP server and password based on the email address. If you have multiple accounts, define them here. Note: The client prepares the HTML body and passes it to the “[body]”. All requeired fields are passed to the “reply.sh” script and it handles the actual server communicatation. If you have multiple accounts, use reply.accounts array with the email addresses so that you can select them from the UI. Can I sort emails in the list view? I prefer to view emails in the right-size panel instead of the current popup mode. Is this possible to rearrange elements to have this view? This will cause the show module to appear in the popup mode only when the viewport size is less that 1400px. You can change the value to fit your screen. My operating system creates a specific file in every folder (for instance Mac OS create a .DS_Store file on every folder that is browsed by the user). Since this file is not a maildir compatible file, my notmuch throws an error. How can I ask notmuch to ignore these files? add ignore=.DS_Store to the [new] section of the .notmuch-config file to ignore this file type. If you have multiple file types use ";" for separation. Is it possible to have multiple list views to view different notmuch queries simultaneously in the screen? Yes, you can create an empty folder anywhere in your maildir and place a file named query in this folder. In the query file insert each query per line, then refresh your extension. When the folder name is pressed in the tree view, the extension fetches the queries from the query file and displays each query line in a new list view. You can have as many queries as you would like to; however, to have them fit in your screen it is recommended to have a maximum of three list views per query file. Note that you can write a complex query to mix several queries in one view. Having multiple list views per single folder is called "smart label" which is a very powerful tool to organize how the extension manages your list view. Note that since the query file is not an email file, you need to add it into the notmuch's ignore list.